I know it’s “fake,” but I enjoy pro wrestling nonetheless. The best answer I’ve read from someone asked “why do you like pro wrestling?” is “it’s a live-action comic book,” and someone else has said that when you watch WWE you’re watching a show about a company putting on a wrestling show; in this sense, it has more in common with The Muppet Show than with MMA, boxing, or basketball. One of the WWE’s best attractions is a tag team called The New Day: Big E, Kofi Kingston, and Xavier Woods. They’re awesome if you like video games and nerddom, and as a former trombone player myself I’m partial to the fact that Xavier Woods enters the ring with a trombone. Anyway, a fake cereal called “Booty-O’s” is part of their schtick. 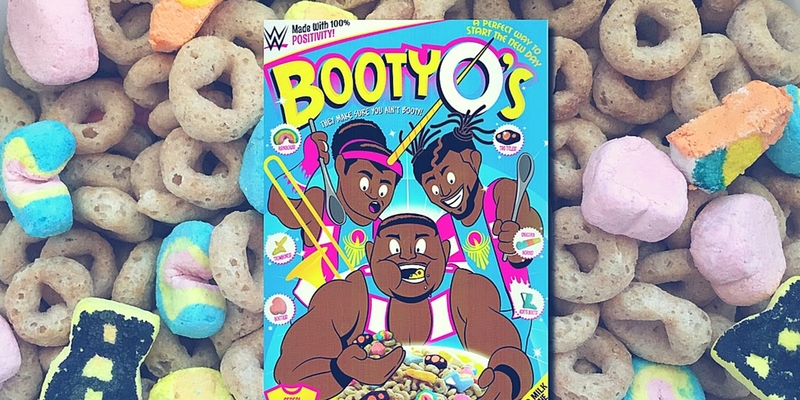 And now, you can buy your very own novelty “Booty-O’s” cereal at FYE.com. We live in a good world. We Could Do More If We Had More Resources! Who Couldn’t?